These sunny necklaces are handmade from sand gathered from your choice of 2,800 picturesque world beaches. Carry a piece of sun, sand, and surf wherever you go with Holly Daniels Christensen's beachy pendants, handmade from a pinch of sand gathered from your choice of one of thousands of picturesque world beaches. 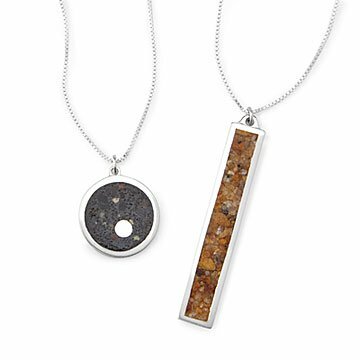 The jewelry maker sets textured samples of sand from your favorite sunny spots in sterling silver bezels sealed with jewelry-grade resin. Organic and utterly modern, they're a unique sculptural way to keep summer vacation memories close. Each necklace comes with a card, which indicates the source of the sand. Handmade in Massachusetts. Click here to see a list of all available beaches. Don't see your beach? You can send in your own sand (we'll send you a mailer and instructions). Also, check out our Custom Beach Bracelets. 65th birthday present for sister, reminder of things we did in our youth. She loves it! Not impressed with the finish and over priced for the quality of the jewelry. My mom loves wearing this and the matching bracelet I got her last year. I received this necklace as a gift several years ago and loved it. It is versatile, beautiful, and holds meaning to my childhood. Because I love it so much, I wanted my sister to have one as well. One of the coolest gifts I ever gave! It is beautifully crafted, simple, yet elegant. One of the best gifts I have given. Meaningful and unique, Mom hasn't taken it off yet! Uncommon Goods has such a wonderful collection of gifts, from artists around the globe. I can always find something that I know will be enjoyed, loved and appreciated. I love how unique this necklace is! My mother had to move last year away from the coast but misses the beach terribly so I purchased this necklace for her as a little reminder and token of her favorite Place. Was looking for something unique and unusual for my wife's birthday and Valentines Day. I found this pendant and started browsing through the list of beaches. To my surprise, I found the beach my wife and I had vacationed at every year for 12 or so years. I ordered, and gave it to her for a late birthday and valentines gift. She loves it and has not taken it off since i gave it to her. It's a little reminder of all the good times we had at that beach. I hit a home run with this one!! We have shared this favorite beach together as best friends and I wanted to give her a special keepsake. She loves the necklace. I also purchased the sand cuff links for my husband-to-be. He loves them too!